Professional-strength cleaner/disinfectant powers off tough soils fast. 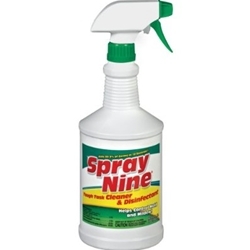 One product to effectively clean, degrease, disinfect, remove stains, control mold & mildew and deodorize. Disinfects killing bacteria and viruses in just 45 seconds. Suggested Applications: Equipment, tools, tires, vinyl & concrete floors, vinyl, stainless steel, painted metal, fiberglass, chrome, engines, plastic, enamel, rubber, walls & ceilings, concrete, sinks, toilet exteriors, showers/ bathtubs and much more!